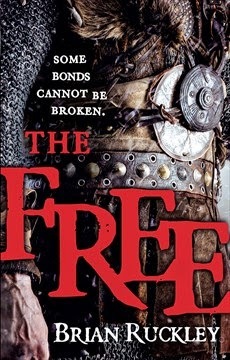 The Free by Brian Ruckley is a gritty (but not quite grimdark) stand-alone fantasy that follows the last and greatest company of mercenaries (a.k.a The Free) as they take on one final contract to right a wrong done long ago. The story is told from the perspective of two characters: Yulan, the righteous leader of the Free; and Drann, a young peasant turned foot soldier turned contract holder. It takes place in a land torn apart by civil war and strife. While the nobility is rising up against royalty, the land and its people must still be protected from the threatening Orphans, a power that is wont to impale families on spikes in a circle so that they can watch each other tortuously die. All of the mercenary companies have since been disbanded, except for the legendary Free of course, and all of the clevers (those who wield magic) are under the control of the School, save those few who ride with the Free. The Free and the School each harbor one of the world’s two tamed Permanences, which are physical representations of pure and destructive magic. These prodigious and terrifying weapons can only be held at bay by the strongest of clevers, at great cost. But when the School’s Permanence goes missing, and Yulan finds out who has it, the final contract of the Free becomes heavier than ever. If the story is starting to sound appealing, that’s because it is. The world building and accompanying magic system is terrific. Magic is centered on entelechs, which are elemental in nature, and those who can harness the entelechs (clevers) must choose to do so wisely. Magic does not come without a price, and each time a clever takes something from an entelech, they must give something back. The most grand acts of magic are breathtaking, but occur at great cost to the clever, a cost of which they seldom recover. Even the simplest form of magic takes its toll, be it in the form of something like a permanently disfigured finger. I like this take on the magic system. So often those who wield magic are envied for their astounding capabilities, which they here, but in The Free we feel a sort of pity for them as well. Imagine being capable of an outstanding feat of power, used however you may see fit, but knowing that releasing even a fraction of your full potential will likely end in your nonexistence. Heavy. Some of the characters are a bit stereotypical, but that doesn’t mean they aren’t well written. Yulan, for example, is a little too righteous of a leader, always worried about not forcing the members of the Free to do something they don’t want to, and not necessarily dropping the axe when necessary. But he is not by any means one dimensional and fights demons of his own. In fact, all around the characterization is astounding. Drann, in his coming of age of sorts, is the most heartwarming, as he has always idolized the Free and now rides with them. And Hestin, whose has hardly a line of dialogue in the whole book, is the most heartbreaking, and the color of her cloak can elicit more emotion from the reader than most characters can throughout an entire novel. The Free does, however, have some minor technical flaws that can effect readability. Mainly, the story shifts between the POVs of Yulan and Drann within chapters, and often this shift is choppy and takes a second to adjust to. Ruckley also uses sentence breaks—like this see what I’m doing here and how you are getting lost inside the sentence thinking about pink elephants and purple lions—which are sometimes confusing. Another flaw with The Free is the predictability of the story line, as it’s not hard to figure out what’s going to happen next. Although, this predictability didn’t really effect my reading, perhaps because the world is so captivating and the characters are so empathetic. Honestly, this is a hard book to put down...and, its relatively short at only around 450 pages. So, if you are looking for a good, engrossing read to perhaps bridge the gap between volumes in a series, give The Free by Brian Ruckley a try…I don’t think you’ll be disappointed.